J. Linford Synder ‘33, distinguished Peirce alumnus, passed away on Sunday, Feb. 16 at the age of 99. Lin was a key member of the College family, whose extraordinary generosity has provided financial support for past, present, and future generations of Peirce students. Lin had a very successful business career fueled by his extraordinary work ethic. After graduating from Peirce, he worked at Foley Advertising and Hatfield National Bank. In 1941, he became a Nationwide Insurance agent, a position he held for 70 years. Lin retired in 2011 as the longest-serving agent in the history of the company. Over the years the Peirce community has honored Lin for representing the College so well and for his dedication to our mission. He was the first recipient of the Pride of Peirce Award. He also received the Peirce Trustee Award for distinguished service, and was an inaugural inductee to the College’s Wall of Fame. 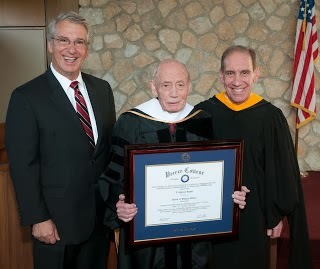 Most notably, Lin received the College’s highest honor in 2011, when he was conferred a Doctorate in Humane letters from the institution. Lin’s affiliation with Peirce spanned more than 80 years of his life. Fortunately, his passion for Peirce and spirit of service for others will live on for many more decades to come through his legacy of financial support for our students and graduates.